With the rain come mangoes! Juicy, sweet and delicious these tropical fruits are in season for several months with the hight of mango season usually taking place in the month of June. Mangoes are loved by many all around the world, and used differently from culture to culture. In Panama, green (unripe) mangoes are a common snack. 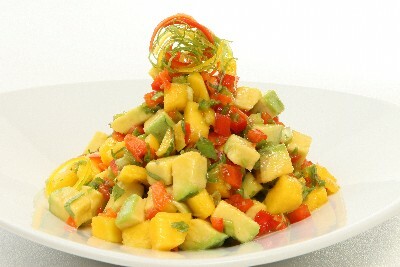 The type of mango that is more commonly used by street vendors for this popular mango salad is the ‘Papayo’ mango. The Papayo mango is a rather large mango, with little fibre and a sweet taste. This local mango salad is usually served in a plastic bag made with four simple ingredients: mango, salt, pepper and vinegar. Love mango? Here are a few more tasty recipes to make this mango season even more delicious. A Lassi is an Indian drink, similar to a milkshake or ‘smoothie’. A dash of cardamom seeds gives the drink a unique spiced flavour. This refreshing drink is perfect for the tropics and is a great way to take advantage of the mango season upon us. To make a mango Lassi at home you will need: 9 oz. of plain yogurt, 4 ½ oz. of milk 3 fresh mangos sliced, 4 teaspoons of sugar, cardamom seeds to taste and a dash of salt. Blend ingredients in the blender on high for approximately 2 minutes. Serve cold. The Lassi can be kept refrigerated for up to 24 hours. In skillet or toaster oven, toast cashews over medium heat until fragrant and golden, about 8 minutes; set aside. Cut pointy ends off mangoes. Set each mango on cut end. Using serrated knife cut off peel. Cut flesh on either side of flat pit into thin slices; stack and cut into thin strips. In bowl, whisk together coriander, mint, lime juice, sugar, fish sauce, oil and chili sauce. Add mangoes, red pepper and onion; toss to coat. (Make-ahead: Cover and refrigerate for up to 2 days.) Sprinkle with cashews. Whisk together the extra-virgin olive oil, 1 tablespoon lemon juice, parsley, garlic, basil, 1 teaspoon pepper, and 1/2 teaspoon salt in a bowl and pour into a reseal able plastic bag. Add the tilapia fillets, coat with the marinade, squeeze out excess air, and seal the bag. Marinate in the refrigerator for 1 hour. Place cubed mango in a food processor, and puree. Pour in simple syrup and lime juice, and puree until smooth. Place in an ice cream maker. Freeze thoroughly. Make sure you have a bowl that’s quite wide to use for the churning/freezing process that comes next. Take your ice cream recipe mixture and transfer to the freezer for about half an hour. Then check just how much the mixture has frozen - ideally, it should have started to freeze at the edges but not fully through to the centre. Take the bowl out of the freezer and beat the ice cream mixture until it’s creamy once again (to dislodge and break up the ice crystals that have formed). Put it back in the freezer for another half hour, then remove and once again beat with a whisk. Do this again so that you have beaten the mixture a total of 3 times whilst freezing in between. Put the mixture back into the freezer for a final time until it’s ready to eat. This can take anything from 30 minutes upwards, depending upon the quantity and type of ice cream you’re making and also how you like the consistency of your ice cream (some people like it softer, some harder).